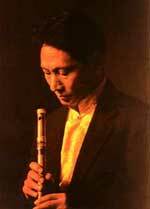 Nawang Khechog is first Tibetan Grammy Nominee and the most renowned Tibetan flutist in the world. He has won multiple awards from Tibet, India, Nepal and United States of America. 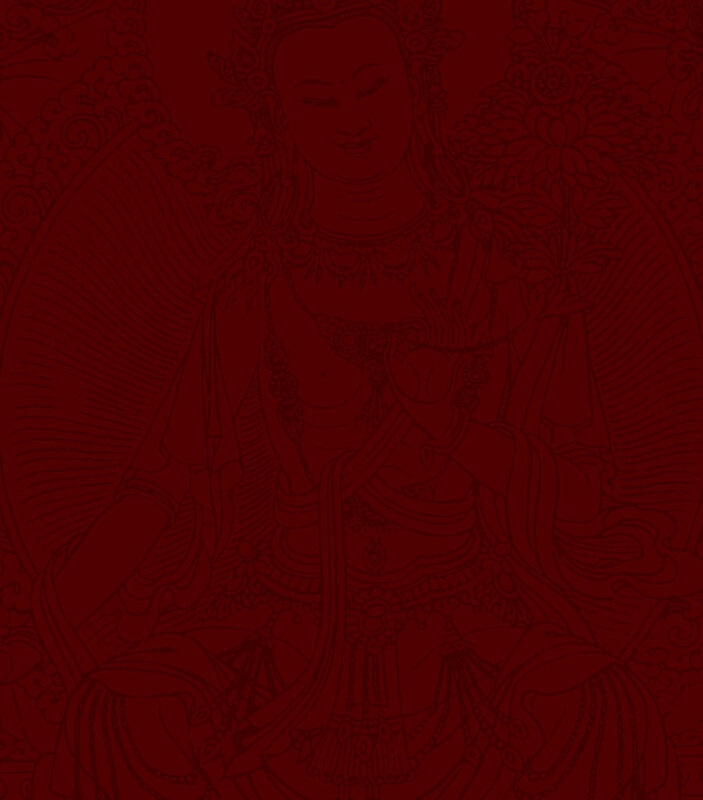 He is one of the Tibet's formost world music & spiritual music composer and also one of the first Tibetan musicians to be able to break into International music scene with his original and authentic musical compositions ( solo and collaborative albums) to be distributed around the world through " Sounds True" and other record labels. Nawang was a monk for 11 years and studied Buddhist philosophy and meditation with His Holiness the Dalai Lama and many other Tibetan masters. 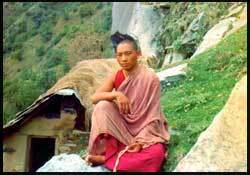 He also lived as hermit, meditating in the Himalayan foothills for several years under the guidance of His Holiness. Nawang received Tibetan Music Award ( "Special Recognition", similar to "Life Time Achievement Award" ) He also received Raasrang World Flute Festival Award of India from Former president of India, Dr. A.P.G. Abdul Kalam and International Civil Golden Award, The Highest Civilian Award of Nepal and he received "The Multicultural Award " from Boulder and the Visionary Awards of Colorado,USA "Best Music of the Year" and "Best World Music". He aims to utilized music as a means to inspire non-violence, compassion and spirituality and for the the freedom of Tibetan people . Nawang has produced over eight albums by himself and co-produced four albums with Jeff Beal "Tibet Cry Of the Snow Lion " with Kitaro and Peter Kater - "Karuna". A solo album and "Dance of Innocents" with Peter Kater on Piano, "Wind of Devotion " with R. Carlos Nakai ( The most prominent Native American Flutist). 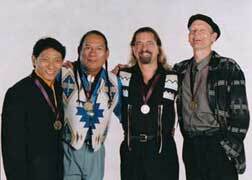 "In a distance place" with R.Carlos Nakai, William Eaton, ( One of the great designer and builder of unique guitars, Will Clipman (a leading percussionist ). This album they not only received the Grammy nomination but they also got three prestigious nominations from the "Nammy Award"( The Native American Music Award ) " The record of the year", " The best instrumental recording" and " The best Duo or group of the year". He also wrote and performed the music for the New York play, 'Road Home' directed by award winning director, Lawrence Sacharow and played by Martin Luther King Jr's daughter, Yolanda King, and other actors. (This is a multimedia play, filmed by Academy Award Winner Barbara Kopple and written by Academy Award Winner James Lecesne). He has played on Kitaro's Grammy nominated albums 'Mandala' and 'Enchanted Evening' and toured with him extensively in the US, Japan, Canada, Brazil and South East Asian countries. Nawang has performed at Carnegie Hall, Universal Amphitheater, Radio City Music Hall, Boston Symphony Hall, The Pentagon, World Peace Festivals, numerous schools, Art Galleries and RFK Stadium, just to mention a few. 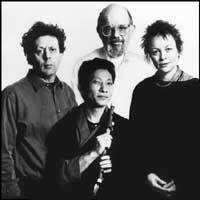 Nawang with Edie Brickell, Paul Simon and Natalie Merchant. 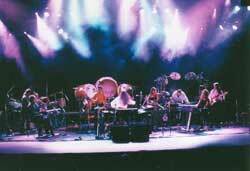 He has collaborated with Philip Glass, Laurie Anderson, Kitaro, Trey Anastasio [Phish], Ustad Sultan Khan, Pt. Shiv Kumar Sharma, David Bowie, Michael Stipe (R.E.M. 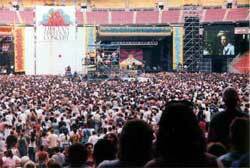 ), Rahat Nusrat Fateh Ali Khan (nephew of the famous Qawalli singer), Natalie Merchant, Peter Kater, R. Carlos Nakai, Paul Winter, Allen Ginsberg, Patty Smith, Steve Gorn, and performed in the same concerts with U2, Pearl Jam, Taj Mahal, Beastie Boys, Ben Harper, R.E.M., Alanis Morissette, Bjork, Sonic Youth, Billy Corgan, Moby, Dave Matthews, Herbie Hancock, Tracy Chapman, KRS-1, Sean Lennon and A Tribe Called Quest. He has also performed many times at the prestigious yearly concerts of Tibet House, New York, benefit & Tibetan Freedom Concerts. Nawang also supports and participated many times with Peacejam Programs, an organization with twelve Nobel Peace Laureates on their Board of Advisors dedicated to youth education and greater human values. 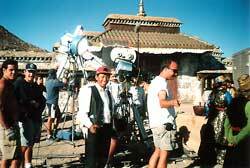 Nawang's music has been used in various documentaries, most recently for part of the sound track of Hollywood's major motion picture 'Seven Years in Tibet,' directed by Jean Jacques Annaud and starring Brad Pitt. 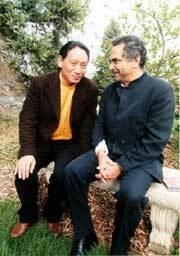 He also worked as a Tibetan Assistant Director and played six different acting rolls for the film. He has also worked at a wide range of causes and organizations, ranging from Schools, Prisons, Buddhist Centres, Interfaith Services to the numerous benefit concerts for AIDS, Environment, Peace, and many Tibet support groups, as welI as the US Tibetan Re-settlement Projects. Nawang was born into a nomadic family in Eastern Tibet, on a high mountain plateau, where trees can not grow and the wind whispers through the grasslands. He learned about life's lessons and survival at an early age. When he was only three years old, a yogi meditator convinced his father that it would be devastating for their family to remain in Tibet, so they fled the land. 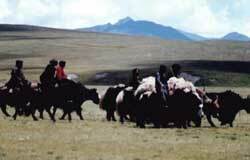 the family travelled thousands of miles to India on the backs of yaks. Following a treacherous three year journey, the yogi's prediction came true in 1959, when China took over Tibet. Nawang's family still suffered - most of his family, including his two younger sisters perished in the hot climate of India. In 1981, Nawang met Leslie Christianson, they married and had two beautiful children, Sangye (son) and Tenzin (daughter). Now, they are grown up as two bright and beautiful children. 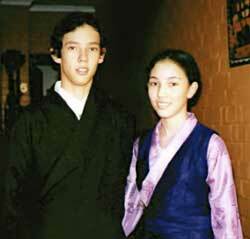 While they were together in Australia, they helped to establish and became founding board members of Australia Tibet Council (ATC) with other Tibetans and Australians who were dedicated to help the situation in Tibet. Meanwhile Leslie became the first founding National Director for ATC and worked hard and effectively to make the ATC the most powerful Tibet support group in Australia. Nawang toured throughout Australia performing and educating Australians for the Tibetan cause and suffering. He also twice presented the first and second 'Five Point Peace Plan' for Tibet by His Holiness the Dalai Lama to the former Australian Prime Minister Bob Hawk. After eight years of thier marriage,they seperated in 1989 but now both are re-married since 1997. Nawang's spiritual friend and his wife Tsering Youdon has finally able to immigrate and join him in USA, after three years of immigration waiting period. 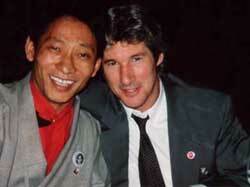 In 1991, he was invited by Tibet House, New York and the co-founder and actor Richard Gere, for a North American tour. Nawang toured numerous cities by giving concerts and speaking out about the situation in Tibet to audiences, radio stations and newspaper journalists during the 'International Year of Tibet' Celebration. In 1992, Nawang opened the Earth Summit Precom meeting at the UN General Assembly Hall. 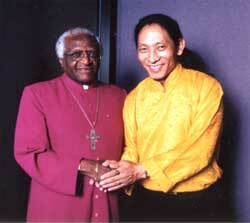 He also performed for many openings for the public address by His Holiness the Dalai Lama and Archbishop Desmond Tutu. Nawang is a self taught musician. 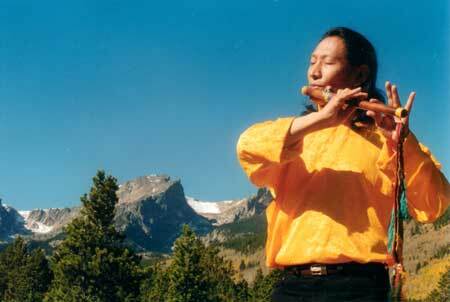 His music springs out of his feeling and life experience as a world traveling, Tibetan nomad. He plays a veritable United Nations of native instruments - including Tibetan long horn, South American Mayan Ocarinas, Australian Aboriginal Didgeridoo, and Tibetan and Native American flutes - as well as more familiar African drums, and other cymbals and bells. 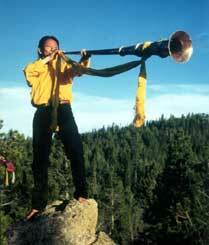 He also performs the ethereal and other-worldly sound of Tibetan, Mongolian and Tuvan overtone Chanting and the Universal Horn. This is Nawang's newly invented instrument, a combination of Tibetan long horn, Aboriginal Didgeridoo and American Trombone. Tibetan multi-instrumentalist, Nawang brings the beauty of his and other countries' ancient ritual sounds to a modern audience with original compositions created with an ear towards uniting old and new in an all-encompassing whole. Nawang Khechog and his wife Tsering Youdon at Grammy Awards. This was Tsering's first week in U.S.
Having spent more than thirty years in India as a Tibetan refugee, Nawang now seeks strength and tranquility in the Rocky Mountains of Colorado. Living in a town, at the foothills of the Rocky Mountains, he looks to the splendor of nature as a continual source of inspiration. Nawang's experiences shape and permeate his music. playing his flute at sunset. with wonderment and made them want to dance.